Underneath our stairs we have a Large Corona Sideboard that we've had since moving in 3 years ago. We actually bought the unit second hand from Facebook and it's pretty scuffed and marked from it's previous owners. I wanted something brighter under the stairs as it can be quite a dark little corner and considered buying something new. 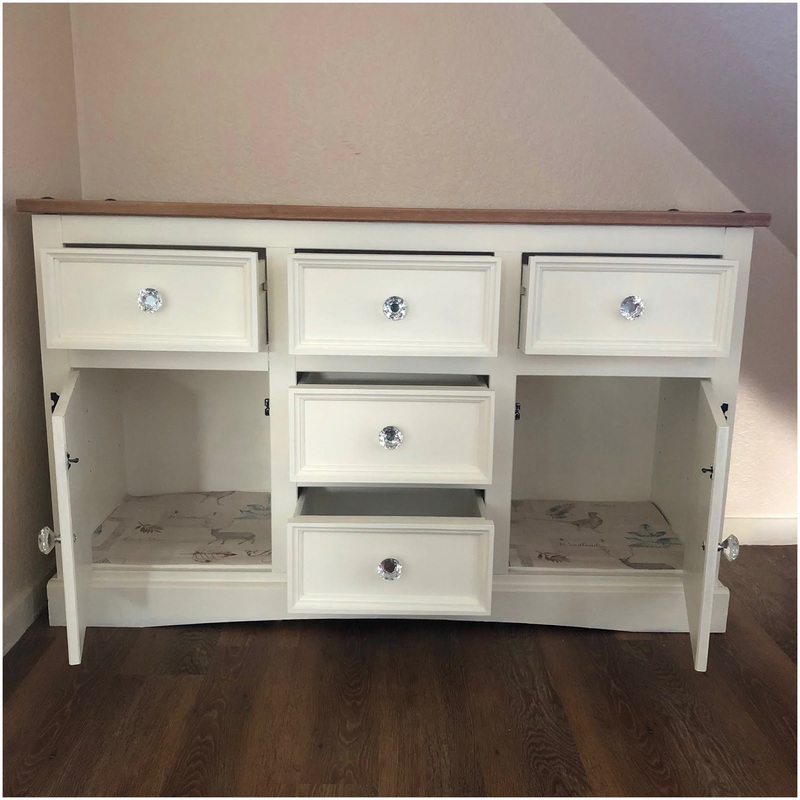 With us getting a new kitchen in January spending £200-£300 on a new sideboard is not justifiable so I started considering how we could upcycle the Corona unit instead. I'm so glad we did. 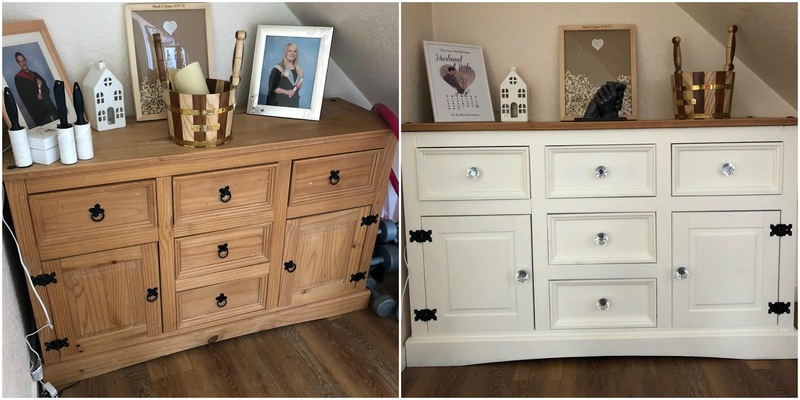 A week, a tin of paint, varnish and new handles and we've got a gorgeous piece of furniture that looks brand new. 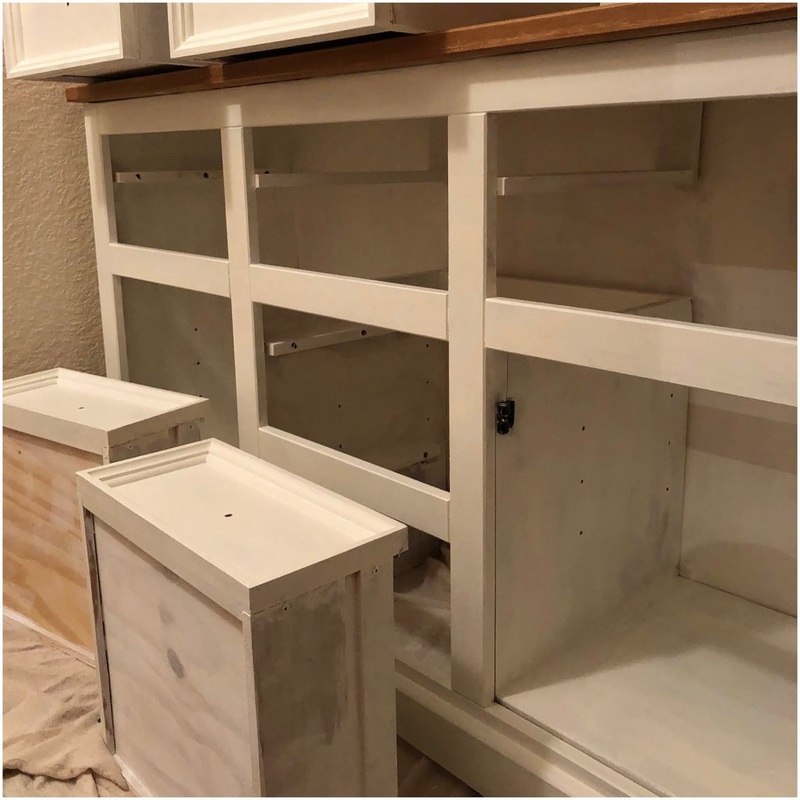 The first step, after emptying all of the drawers, cupboards and clearing the stuff stored on top, was to take off the hardware. The drawer and door handles were removed and the doors were taken off with their hinges. 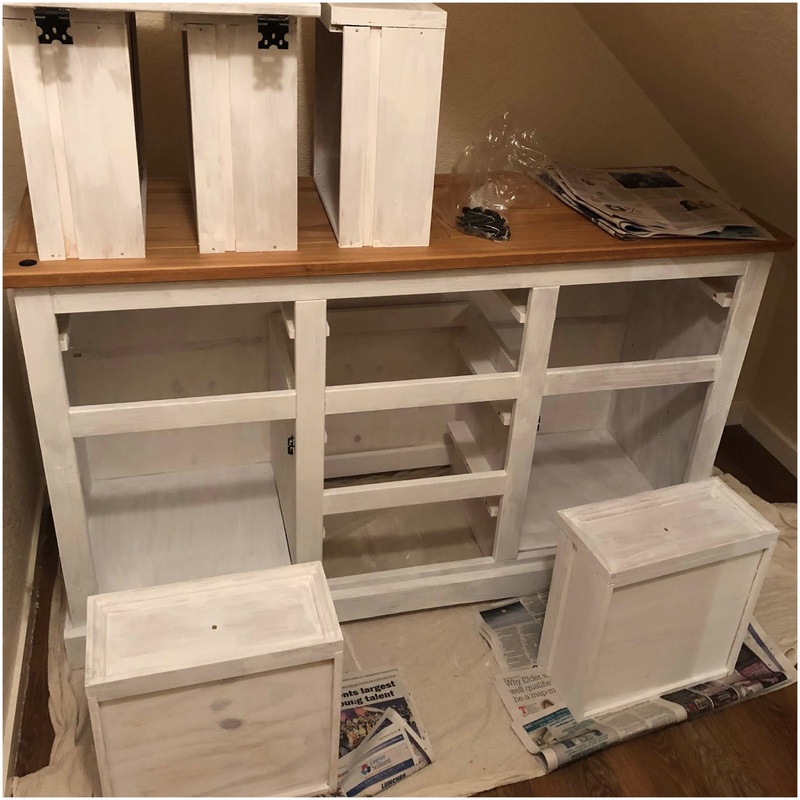 The unit was then sanded down and a primer was applied. This undercoat gives a better surface for the paint to adhere to and with us going lighter it's the best way to start out. After leaving it to dry it was time to start on the paint. 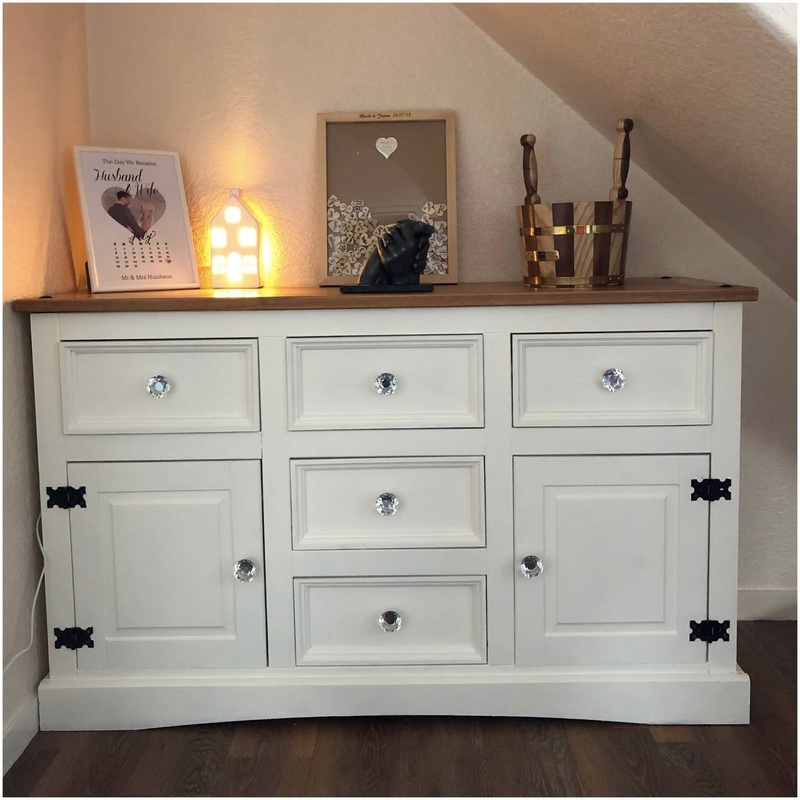 We thought about a chalk paint but actually went for a non drip satin instead. Rather than a brilliant white we chose an off-white called Stone White from Crown. The satin sheen finish is perfect for on wood and gives a durable finish which can be wiped clean. Although it's meant to be a quick dry paint only one coat of paint could be done each day. Rather than painting the whole unit we left the top as a pine wood surface. It was given two coats of varnish to freshen up it's appearance and to protect the wood. The crystal doorknobs are from Amazon and came in a set of 10 with various screw lengths which was handy for making sure they would fit. They look so much nicer than the harsh black drawer and door handles that were in it before. The clear cut crystals and aluminium alloy also match in really nicely with the light shade that hangs in the hallway. I'm Glad I opted for the 40mm size instead of the 30mm ones. They're big and bold but also much more practical to use. They extra £3 or £4 was worth it for the size. Inside the drawers and cupboards we've got wallpaper as a lining. This is brilliant for brightening up the inside but also protecting the paint. You can buy actual drawer liners, some has adhesive to stick in place but left over wallpaper or wallpaper samples are a fantastic alternative. Ours was put in place when the paint was still slightly tacky. The unit is home to lots of random things on the inside. We've got a drawer for hats and gloves, a drawer for candles and melts and a drawer for photos. It's also home to the takeaway menus, sellotape and shoe polish - essentially the junk drawer. So while the drawers and cupboards are all quite full we've kept the top quite simple displaying some of our wedding memories. We've got our hand-cast which was done after the wedding with our rings, our guest heart frame, our wedding cog, a frame with a wedding date print and a little house shaped light.